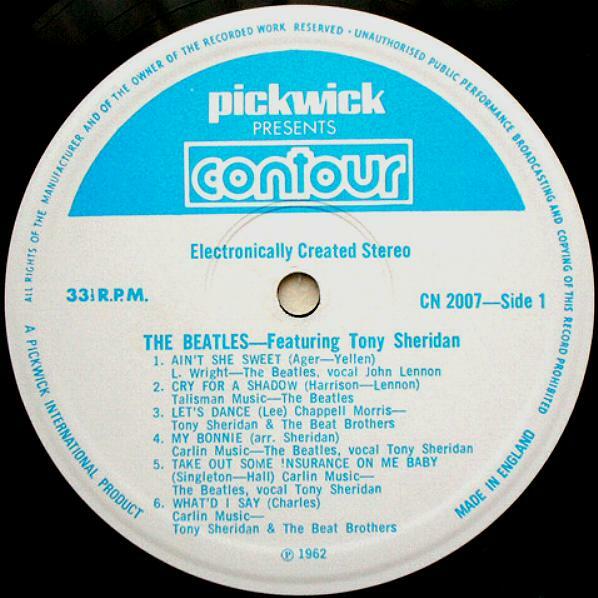 The Beatles Featuring Tony Sheridan – The Early Years, Contour 2870-111. 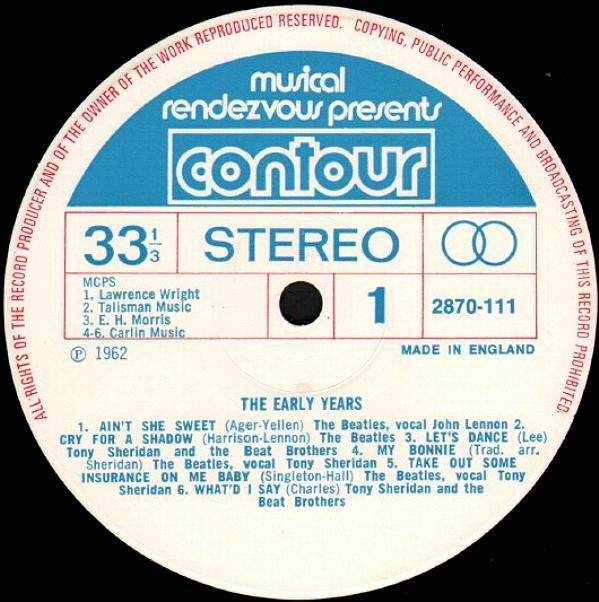 UK label from the 1960s and 1970s owned by Polydor Records’ British branch specializing in budget reissues from its catalog plus childrens’, soundalike and easy listening recordings. 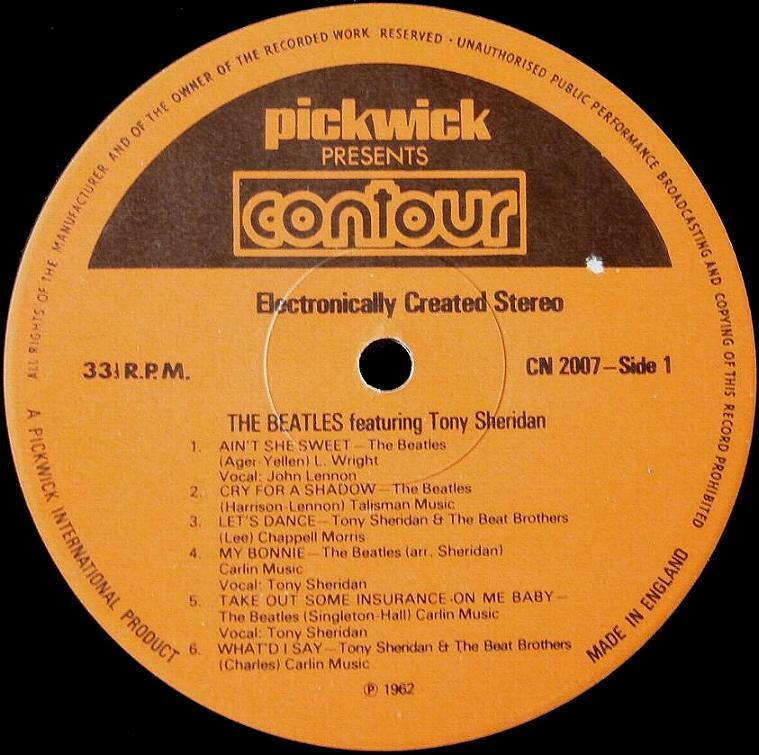 “The Beatles Featuring Tony Sheridan – The Early Years”, Contour 2870-111, was released in 1971. 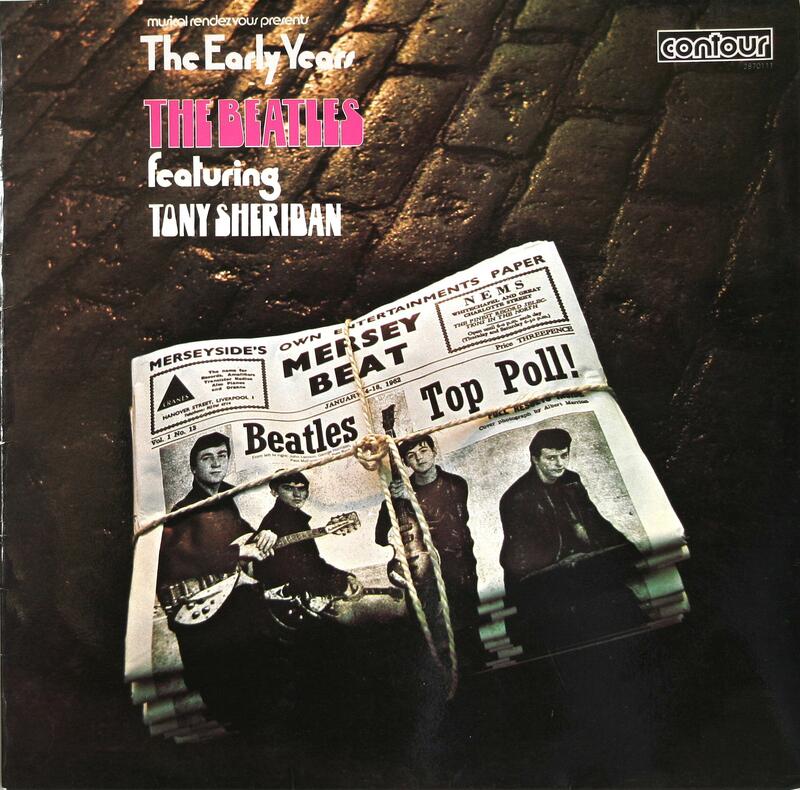 Album “The Early Years” is a reissue of the British version of “The Beatles’ First” (Polydor 236 201) using a redesigned cover. 1. 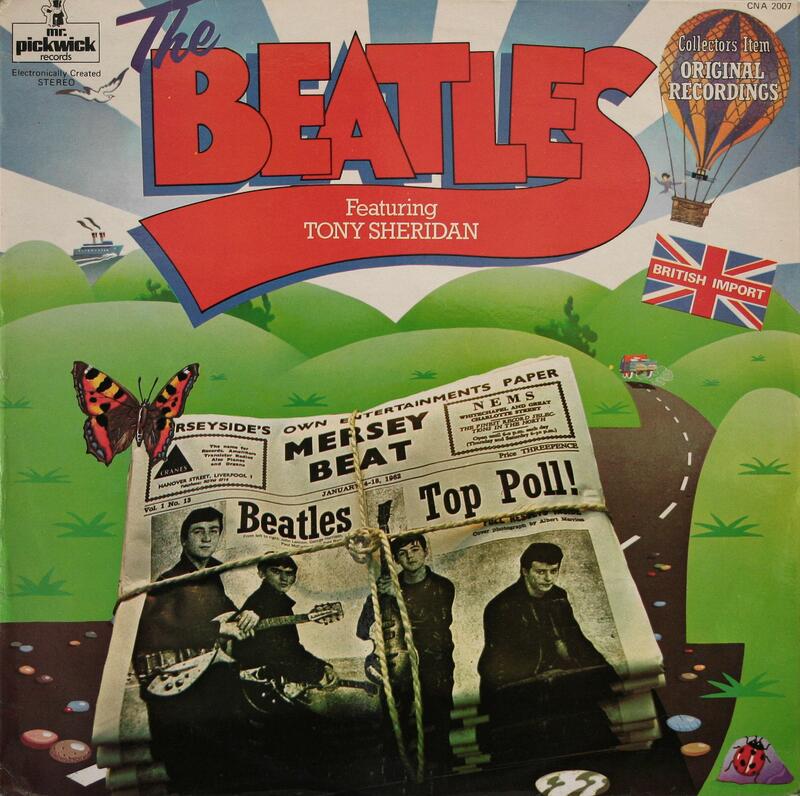 First pressing, early 1971. White and blue labels with red lines and red perimeter text. Matrix numbers: Side 1: 2870111 2870125 A//1 420; Side 2: 2870111 2870125 B//1 420. 2. 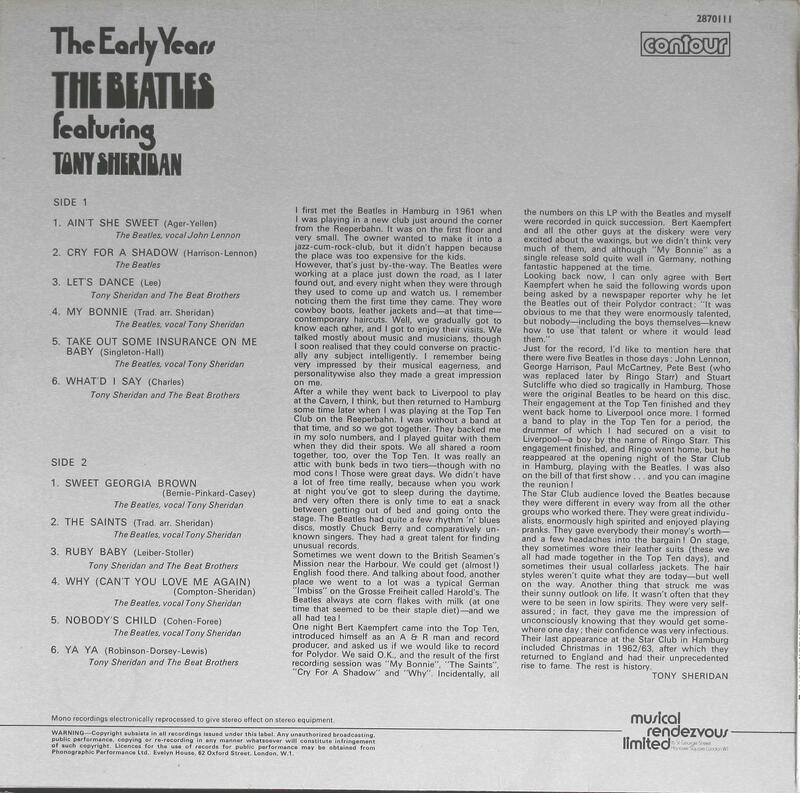 Second pressing, 1971. White and blue labels, with the same matrix numbers. 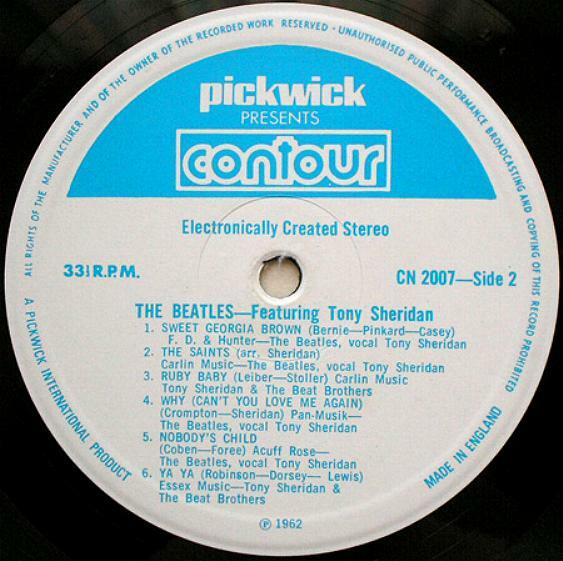 The Beatles Featuring Tony Sheridan, Pickwick CN(A) 2007. 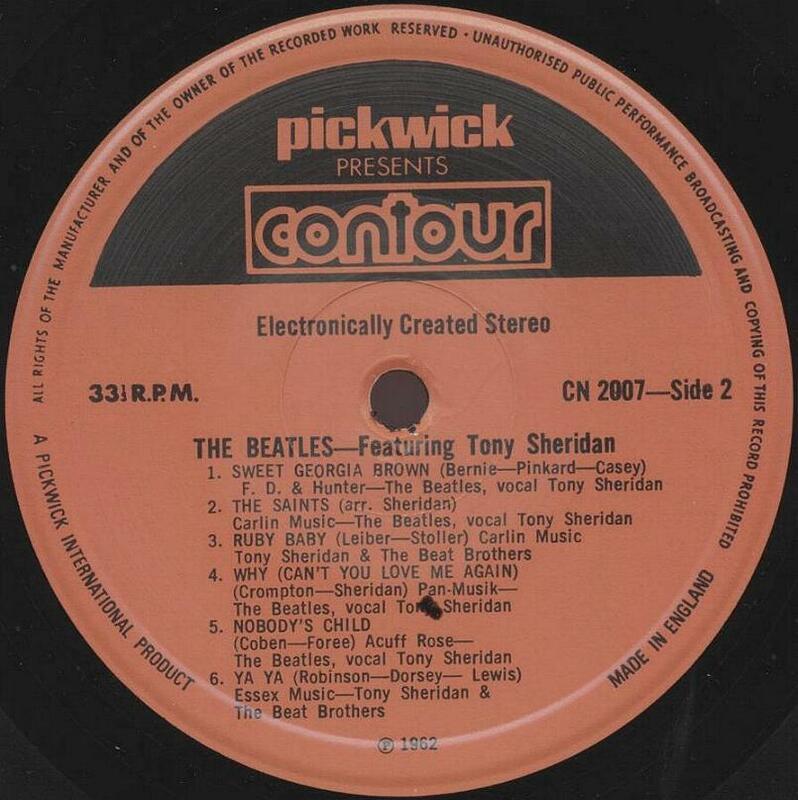 The Beatles Featuring Tony Sheridan, Pickwick CN(A) 2007. Pickwick Records was an American record label and British distributor known for its budget album releases of sound-alike recordings, bargain bin reissues and repackagings under the brands Design. 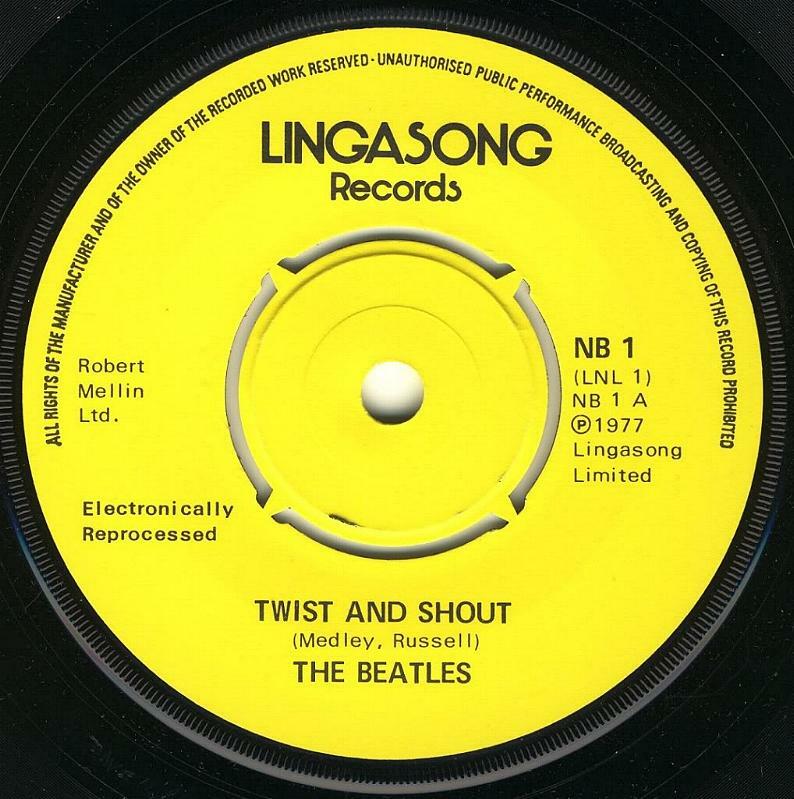 It was the first UK company to put in place exclusive licensing deals with the major record companies (for many years it was the official budget reissue outlet for labels such as RCA and CBS.) Pickwick was sold in 1977 to American Can Company, who relocated their corporate headquarters from Long Island City, New York to Minneapolis, Minnesota. In the 1970s the label changed direction, and began reissuing LPs that had been deleted from catalogs of the major record labels, in particular the RCA Records subsidiary RCA Camden, itself a reissue label. Pickwick also reissued numerous LPs from the Motown catalog during the 1970s. Pickwick’s assets were purchased by PolyGram Records in the late 1970s. 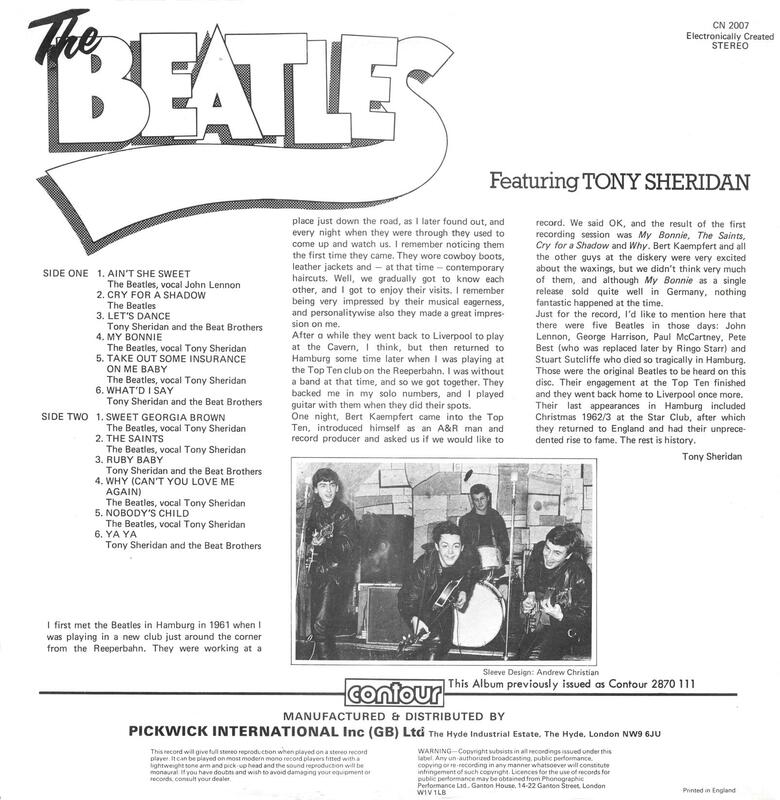 Pickwick’s catalog is now owned by Universal Music, which merged with PolyGram in 1998. 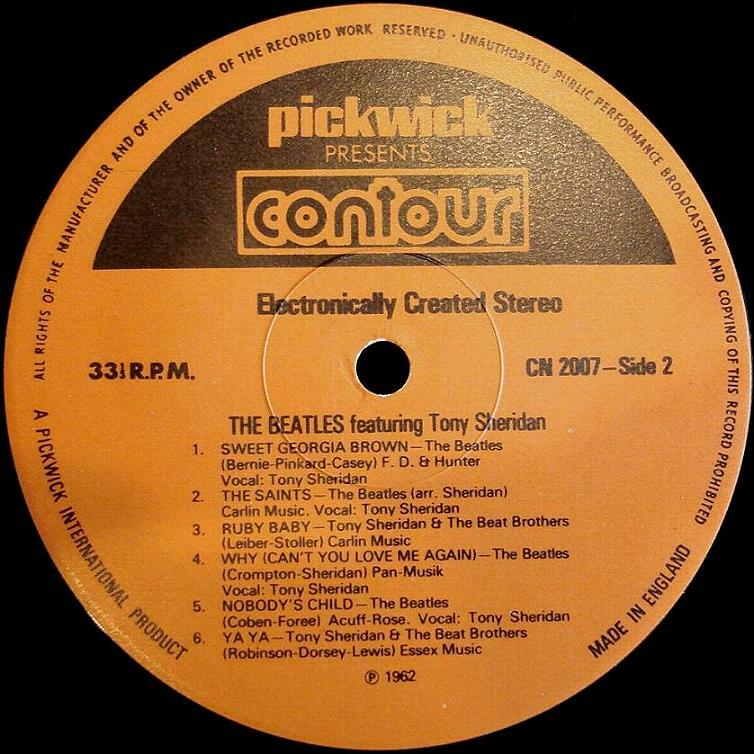 The Beatles Featuring Tony Sheridan, Pickwick presence Contour, CN(A) 2007. 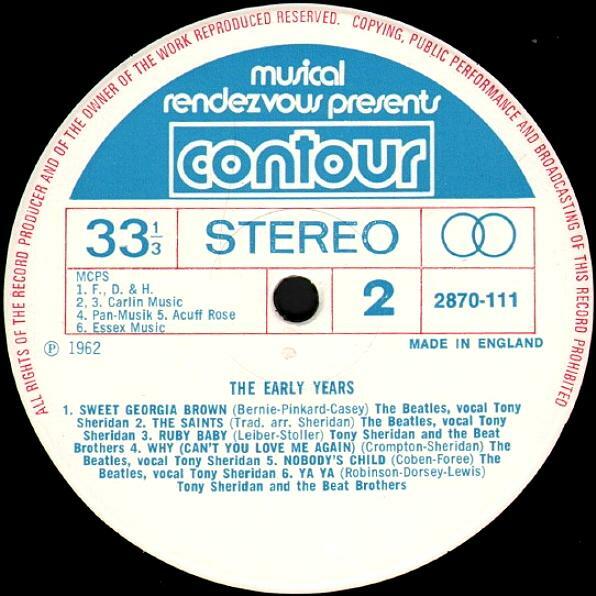 This album is a reissue of the British version of “Early Years” (Contour 2870 111). At the same cover design was again changed and the name of the album cut. Text appears “Collectors item original recording” in the upper right corner. Has also been modified catalog number. 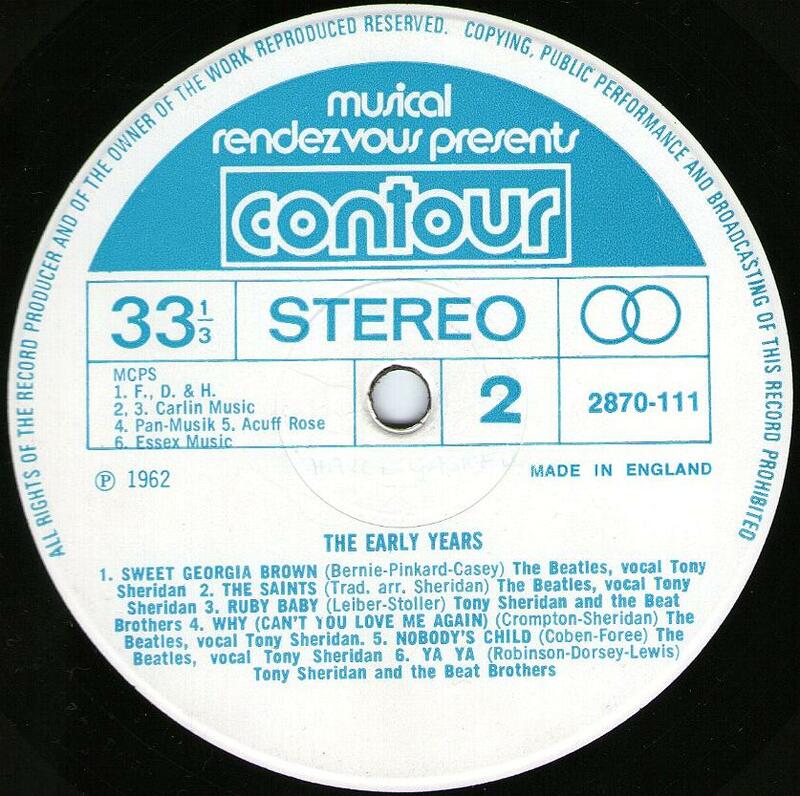 Album were sold in Britain still has the Contour logo on both sides of the cover. Cover is front laminated. Includes plain white paper inner sleeve. 1. First pressing, early 70s (probably 1973). Light orange labels with “Pickwick presents” text and Contour logos. Matrix numbers: Side 1: CN 2007 1Y//1 420; Side 2: CN 2007 2Y//1 420. 2. 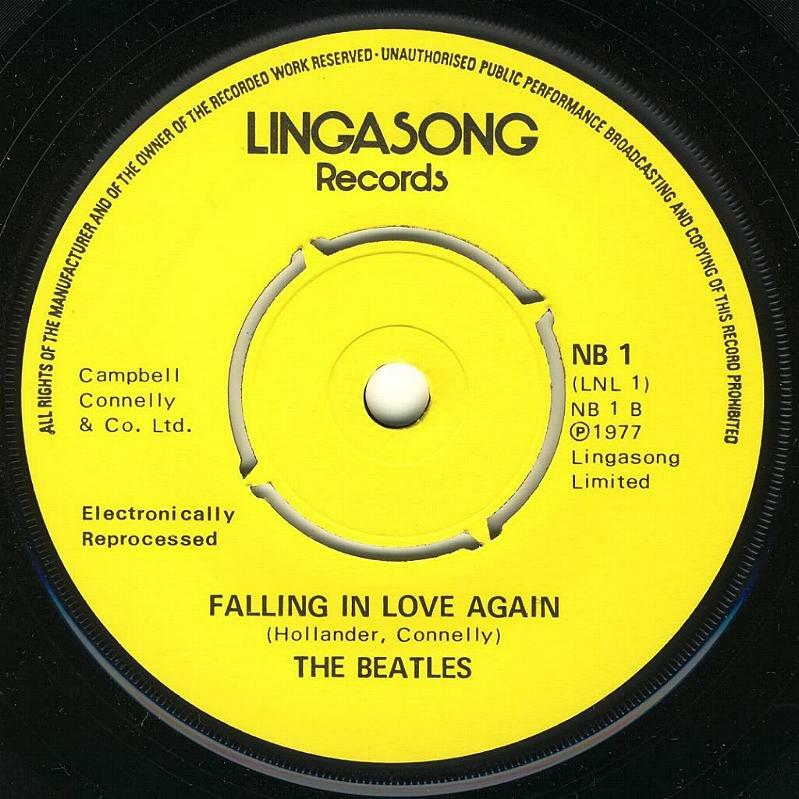 Second pressing, 1970s (probably 1974-1976). White and blue label design with “Pickwick presents” text and Contour logos. Matrix numbers: Side 1: CN 2007 1Y//2 420; Side 2: CN 2007 2Y//2 420. 3. 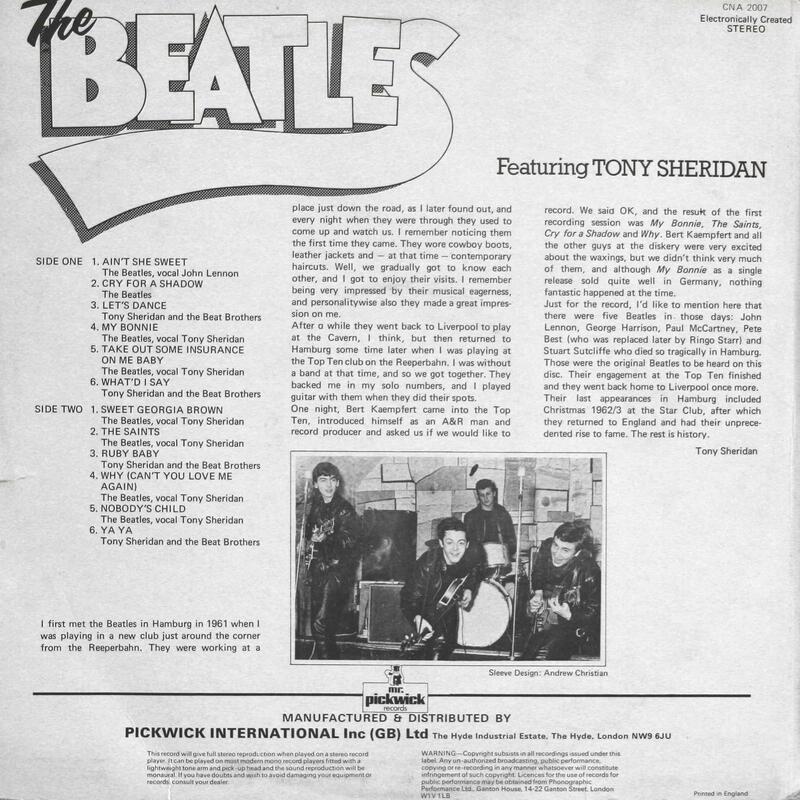 Third pressing, 1970s (probably 1976-1978). Dark orange labels with “Pickwick presents” text and Contour logos. Matrix numbers: Side 1: CN 2007 A//4 420; Side2: CN 2007 B//2 420 (or B//3). Export pressing, late 70s (probably 1976-1978). 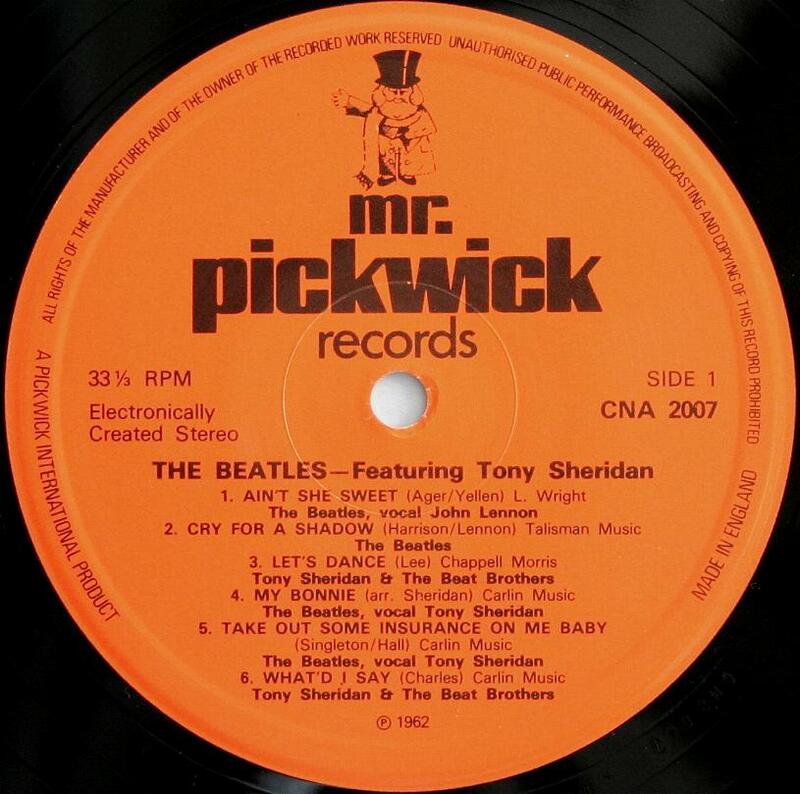 The export version of the album was released on the Pickwick label and thus has the Pickwick logo on both sides of the cover. In addition, the cover has an image of the British flag with the “British Import” text on the front side. This version was imported in United States. Cover is front laminated. Includes plain white paper inner sleeve. 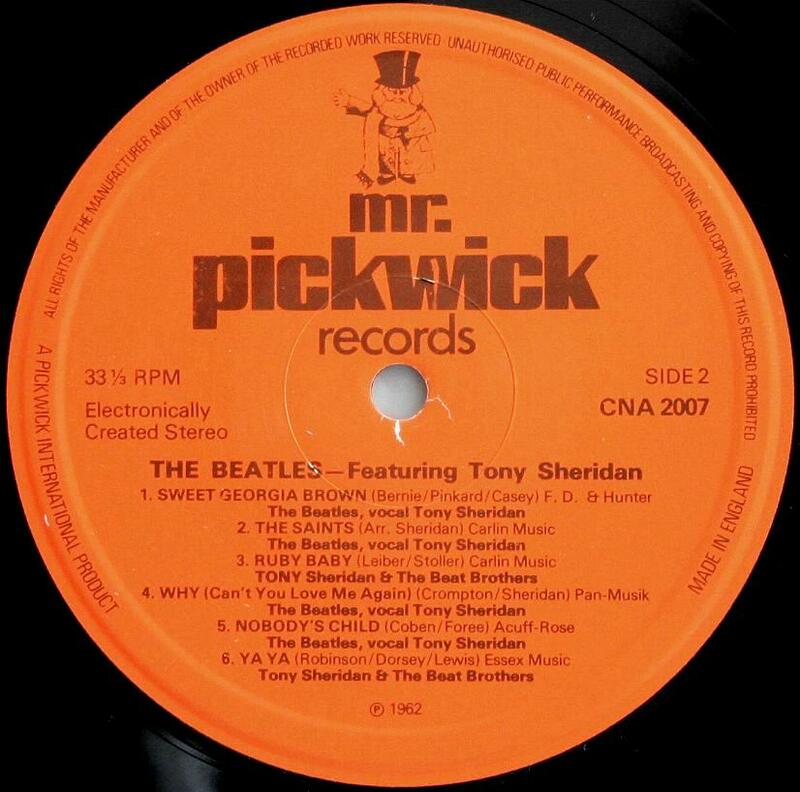 Orange labels are “Pickwick” logo and catalog number with CNA prefix. Matrix numbers: Side 1: CN 2007 A//4 420; Side2: CN 2007 B//3 420. 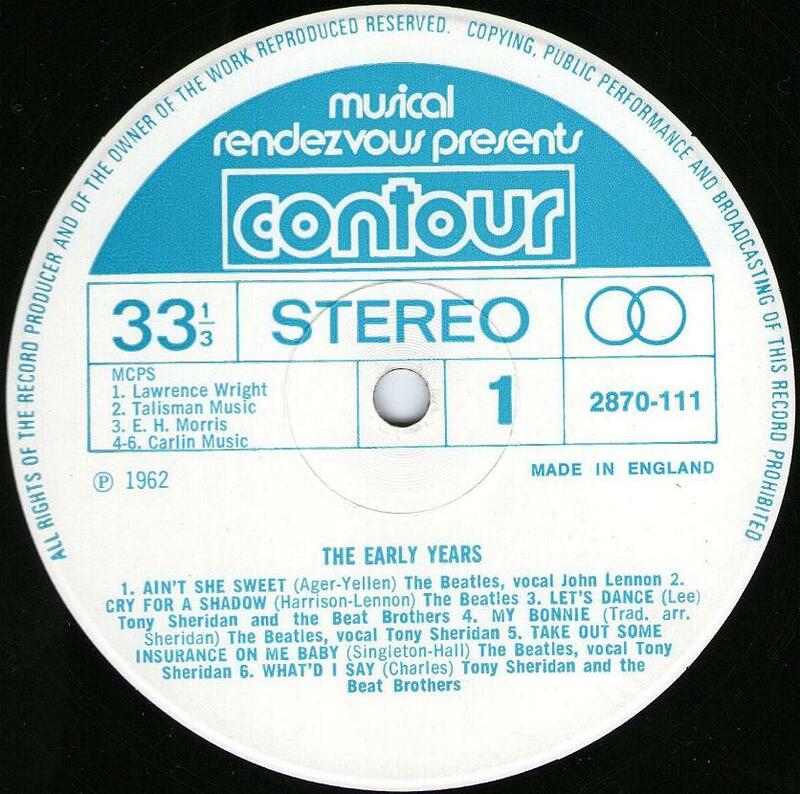 In Commonwealth countries the album was exported as “Pickwick presents Contour” c Contour logos. Cover has a “Half British Flag” sticker with rounded corners and with “direct import” text. The Beatles Live! At The Star-Club In Hamburg, Germany; 1962, Lingasong LNL1. 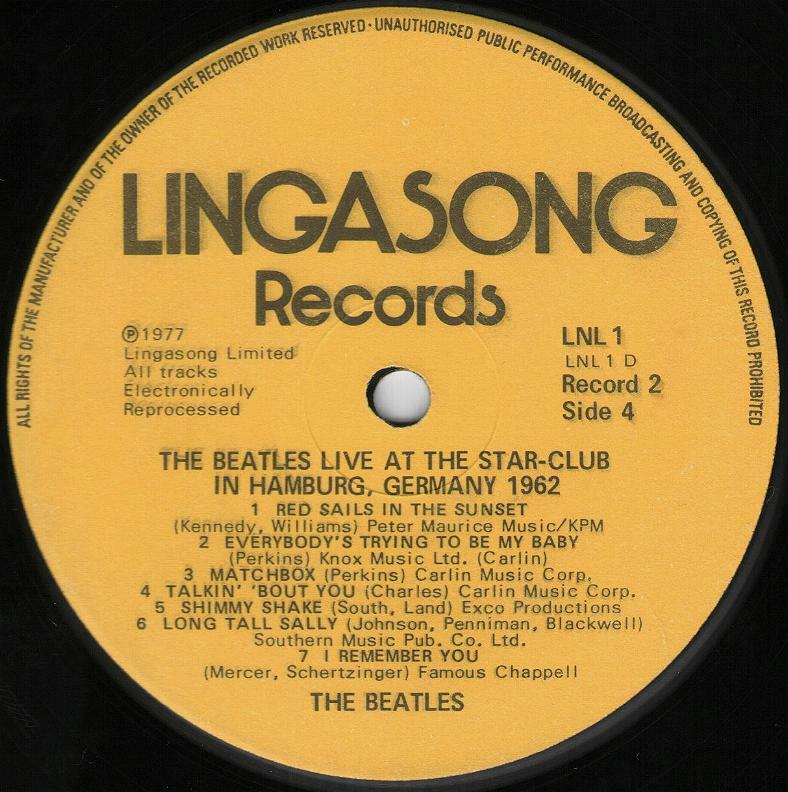 Lingasong Records was a record label formed by Paul Murphy of Buk Records for the sole purpose of producing and marketing The Beatles’ “Live album Live! at the Star-Club in Hamburg, Germany; 1962”. 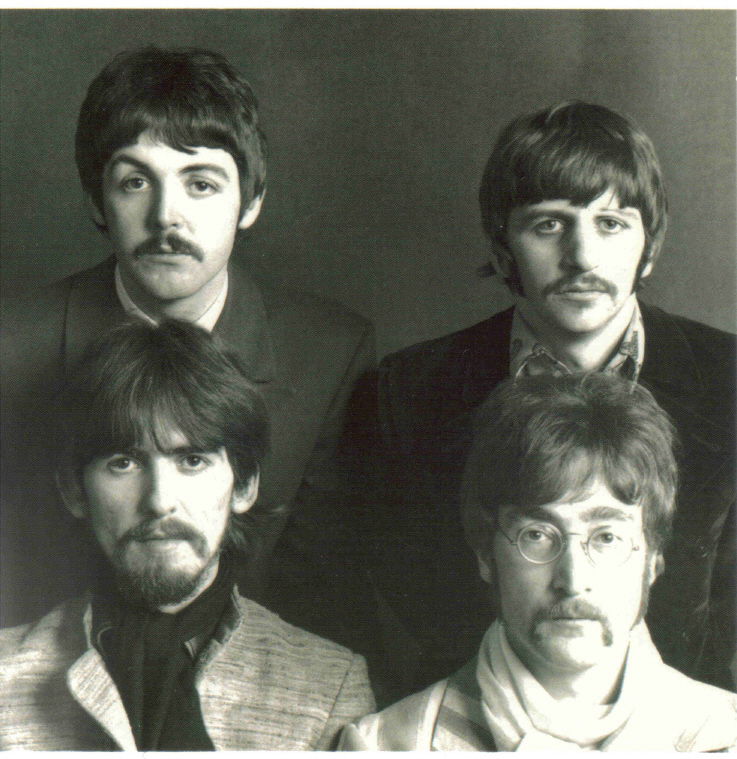 The album was released in 1977 after The Beatles lost a court case to block it. 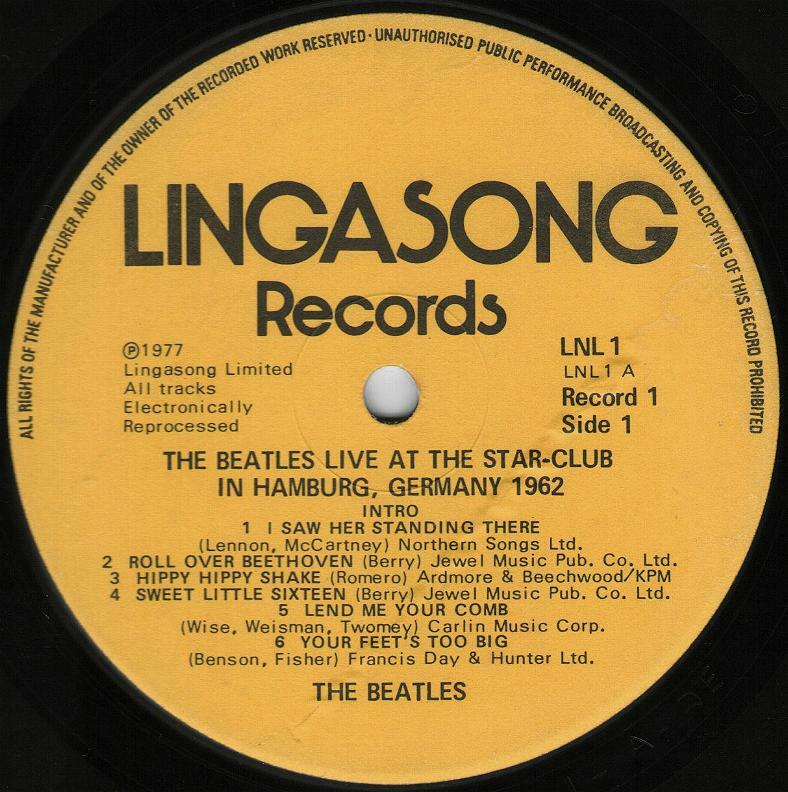 Lingasong teamed up with other record labels for distribution of the album in various countries, and the songs themselves were later licensed to other record companies. 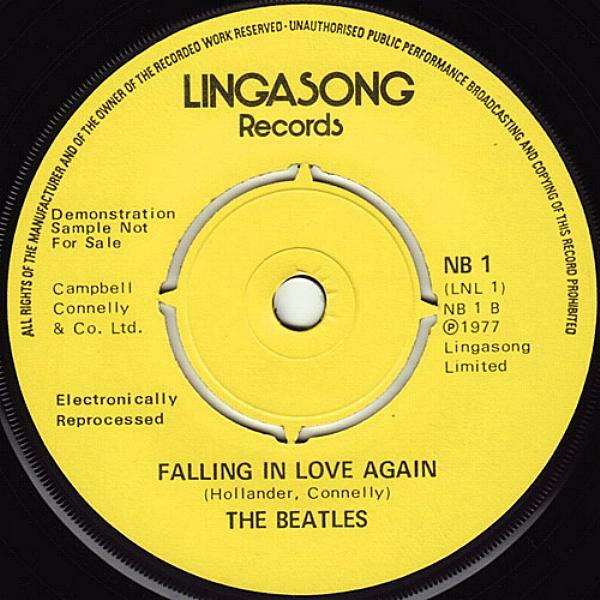 Twist And Shout / Falling In Love Again, Lingasong NB 1. 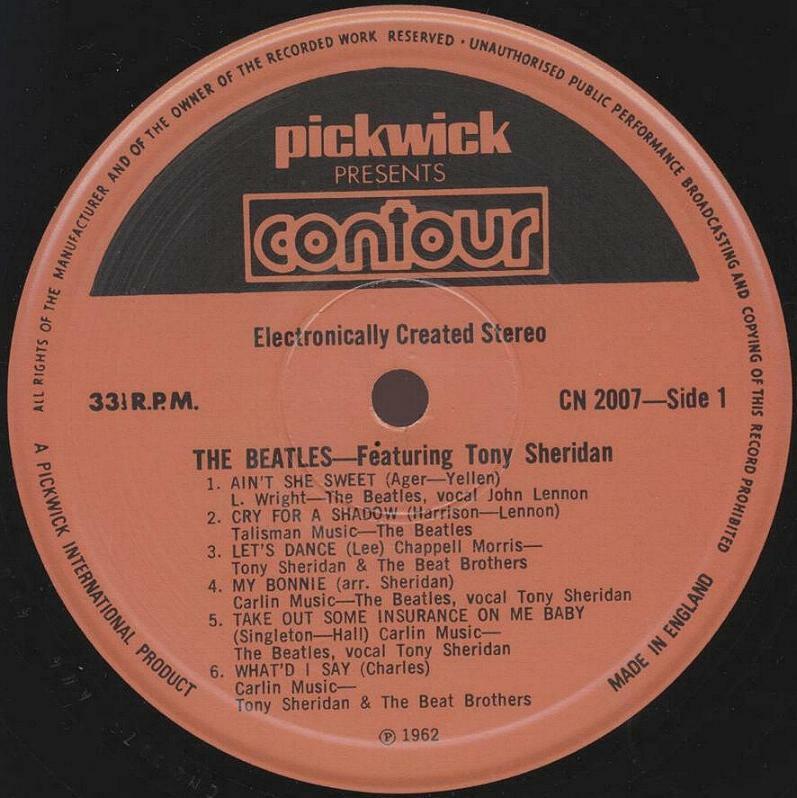 Both tracks taken from the album The Beatles’ “Live! At The Star-Club in Hamburg, Germany; 1962”. 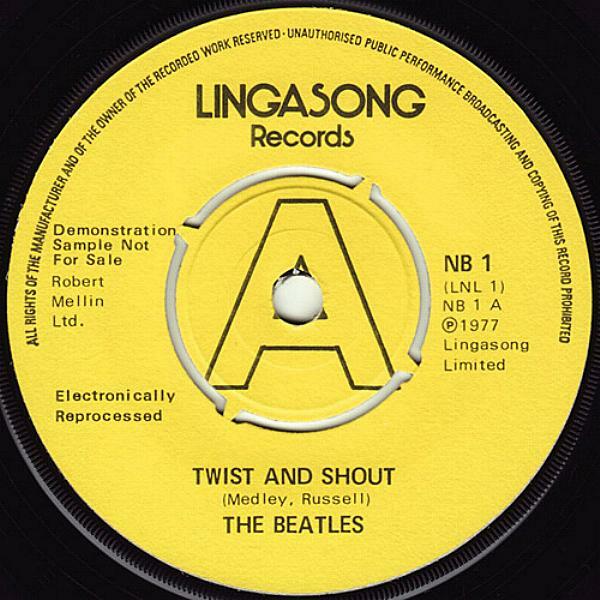 Single was released to promote the album on May 25, 1977. It was released in a plain white sleeve. Live! 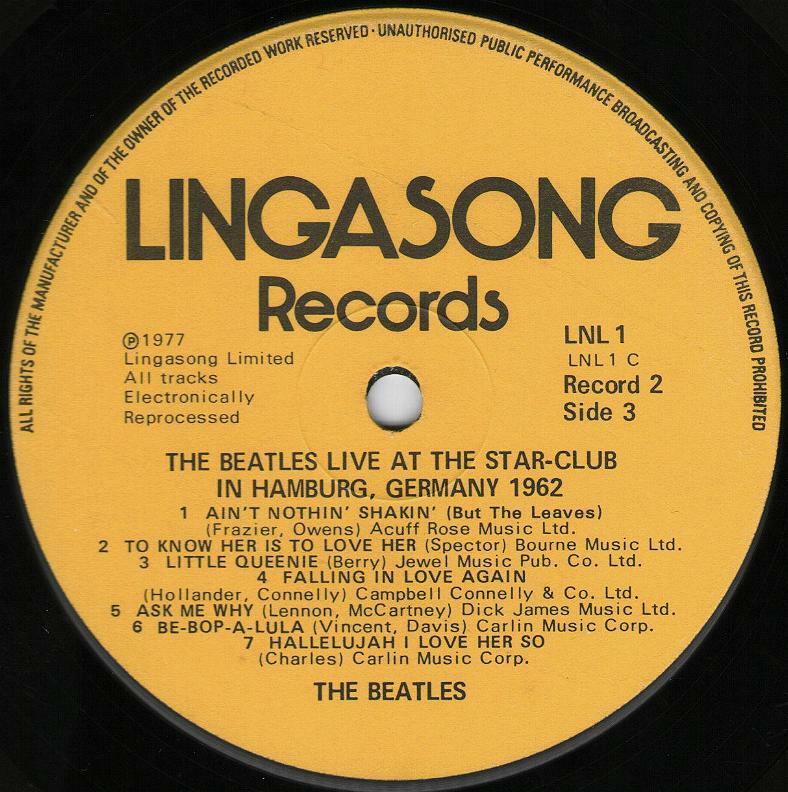 at the Star-Club in Hamburg, Germany; 1962, Lingasong LNL 1, is a double album featuring live performances by The Beatles, recorded in late December 1962 at the Star Club during their final Hamburg residency. Recorded by Ted “Kingsize” Taylor at the Star Club in Hamburg, Germany between December 18 and 31, 1962. 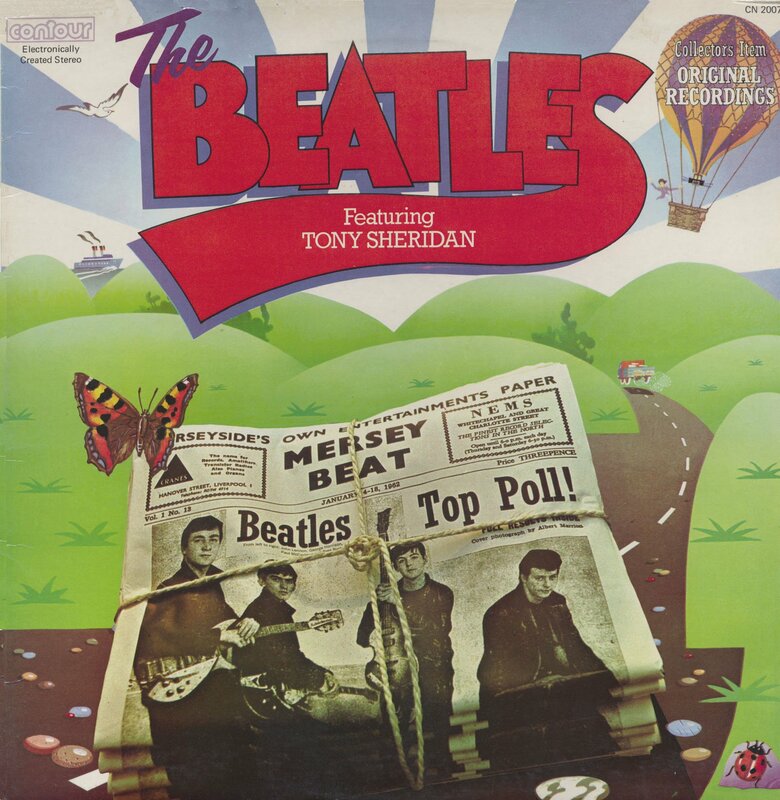 The tapes were originally described as having been recorded in the spring of 1962, an attempt to pre-date The Beatles’ June 1962 contract signing with Parlophone. 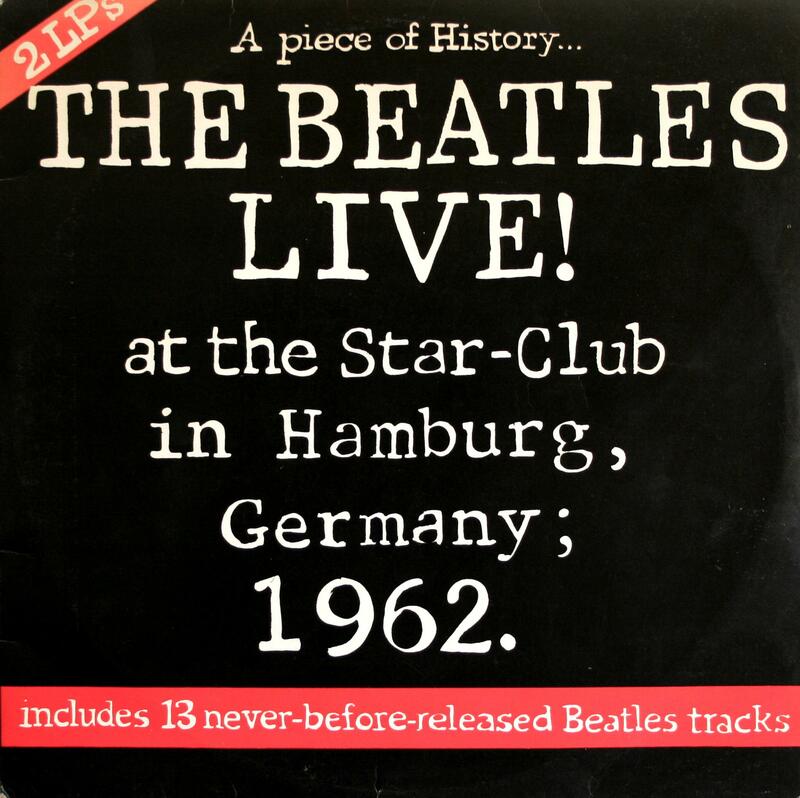 However, song arrangements and dialogue from the tapes pointed to late December 1962, and a recording date of 31 December 1962 (the group’s last day in Hamburg) was commonly cited. 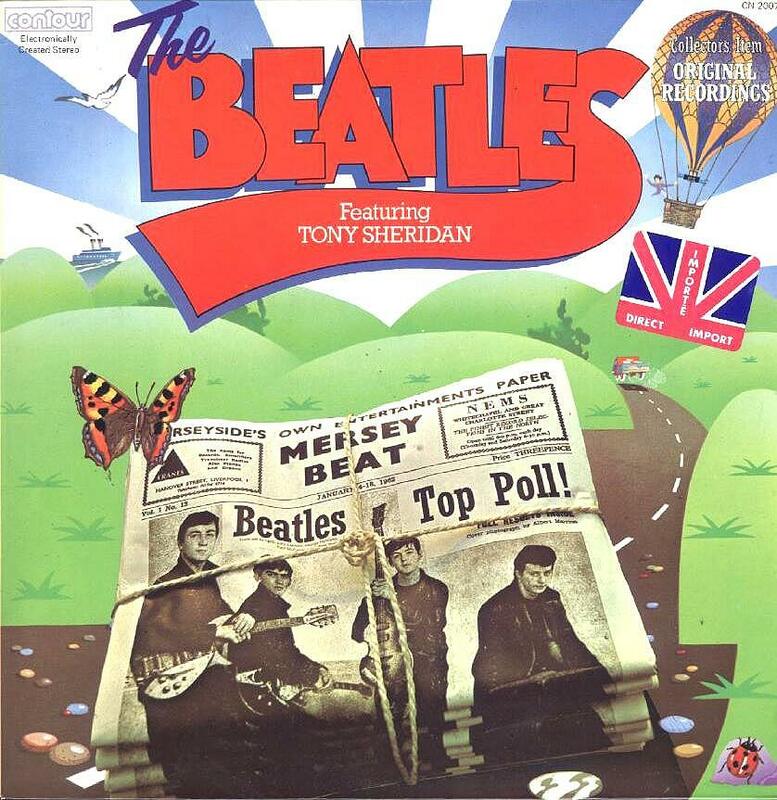 Later researchers have proposed that the tapes are from multiple days during the last week of December; Allan Williams (The Beatles’ booking agent at the time) recalled that a total of about three hours was recorded over three or four sessions between Christmas and New Year’s Day. The album first appeared in Germany in April 8, 1977 in association with Bellaphon Records, and was released in the UK on May 25, 1977. 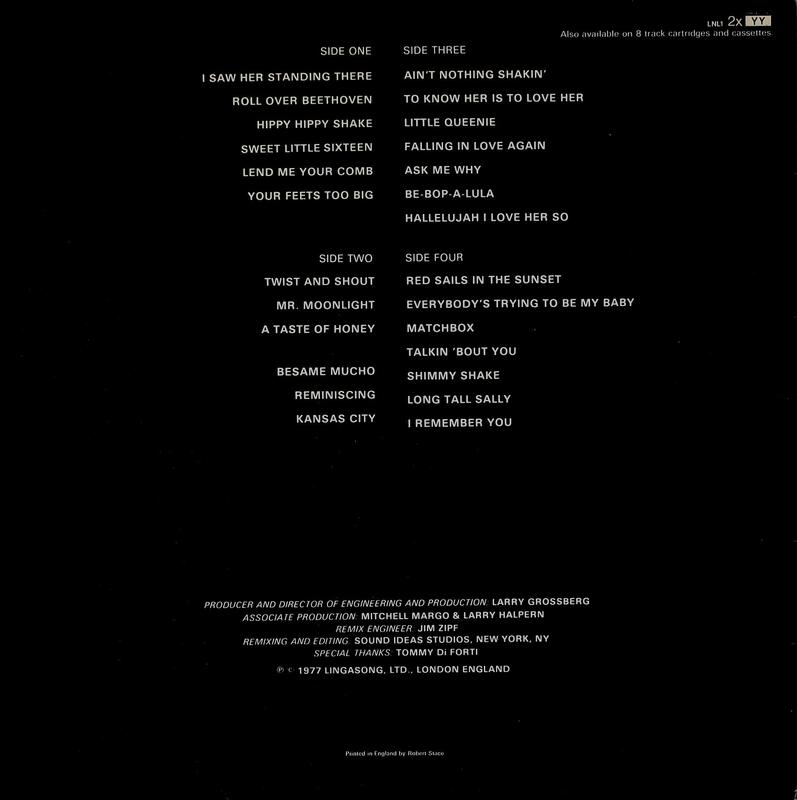 The album has a gatefold sleeve and plain white inner sleeves. Matrix numbers: Side 1: LNL1-A-2E; Side 2: LNL1-B-1E; Side 3: LNL1-C-2E; Side 4: LNL1-D-1E.